The BenQ GL2580H is a popular budget monitor, but how does it compare to similarly-priced newer displays? Let’s find out. First of all, the BenQ GL2580H is based on a TN panel which means you’re getting the narrow 160°/170° viewing angles that cause the image to shift in color, contrast, and brightness when you look at the screen from an angle. Further, in comparison to IPS and VA panels, the colors on TN displays aren’t as vibrant and accurate. You do, however, get a quick 1ms response time speed – on Amazon, the product description shows a 2ms response time speed, but on BenQ’s product webpage, it states that the BenQ GL2580H has, in fact, a response time speed of 1ms. Either way, there’s no noticeable ghosting nor motion blur of fast-moving objects though the BenQ GL2580H monitor won’t attract competitive gamers due to its limited 60Hz refresh rate. 1080p resolution suits the 24.5″ viewable screen of the monitor well as there’s a decent and balanced amount of screen space and detail clarity available. What’s more, 1080p won’t be too taxing on your PC system. In the embedded player above, you can see the BenQ GL2580HM model which is the same monitor but with built-in speakers. The BenQ GL2580H input lag performance is very good with around 13ms of delay which is even acceptable for competitive gaming though a higher refresh rate display is highly recommended in that case. We didn’t find any defects such as excessive backlight bleeding nor dead/stuck pixels; you can also overclock the display up to ~75Hz by creating a custom resolution. The backlight of the monitor is flicker-free and there’s an integrated low-blue light filter with four different levels: Multimedia, Web Surfing, Office, and Reading. In the OSD (On-Screen Display) menu, you will find all the common picture adjustments such as contrast/brightness, hue/saturation, sharpness, color temperature, gamma, input source selection, etc. Unfortunately, there aren’t any exclusive gaming features such as AMD FreeSync, custom crosshairs, gaming presets, and the like. You will find pre-calibrated picture presets (Standard, LowBlue Light, Movie, Game, Photo, sRGB, ECO, and User) as well as three overdrive settings for the response time (Off, High, Premium). At the bottom bezel, there are five OSD hotkeys plus a power button. You can assign up to three hotkeys as shortcuts for certain functions in the OSD menu. 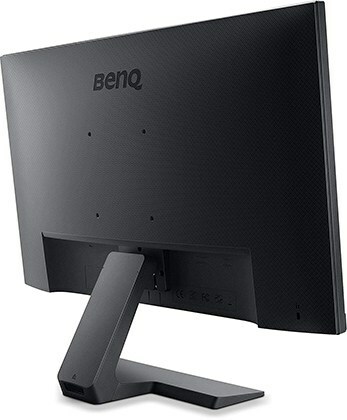 The BenQ GL2580H 1080p monitor has a decent design for the money with a textured finish, ultra-thin bezels, a sturdy base, and a concealing cable management system. It’s also VESA mount compatible, but the stand is tilt-only by -5°/20°. Turning to the connectivity, there’s a VGA, a DVI, an HDMI 1.4, and a headphones jack available. The BenQ GL2580HM model has two 1W integrated speakers in addition. 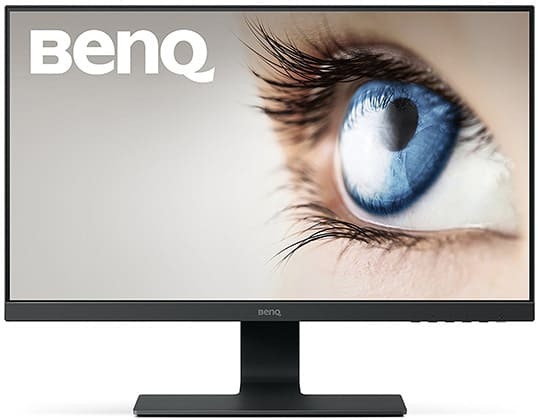 The BenQ GL2580H price amounts to a little bit less than $130 which is rather steep considering that you can get 1080p IPS displays for the same amount of money or even less. For instance, the Acer SB220Q is a 21.5″ 1080p 75Hz IPS monitor available for under $100. It’s a bit smaller, but it offers a notably better picture quality. 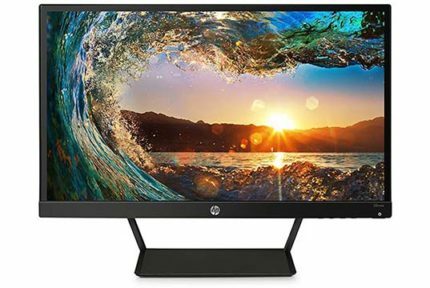 Additionally, you should consider the LG 24MP59G and the HP VH240a as better alternatives for the money. These IPS models offer wider viewing angles and better color reproduction and while they do have a slower response time speed on paper, you won’t encounter any prominent ghosting on either of these displays. While the BenQ GL2580H is an all-around solid and reliable monitor, there are simply better alternatives available under $150. For gamers, we recommend the LG 24MP59G due to its exclusive gaming features including AMD FreeSync up to 75Hz, Motion Blur Reduction, custom crosshairs, etc. The HP VH240a is slightly cheaper; it has no special gaming features, but it features an ergonomic design. Lastly, if you have a limited budget, we recommend the Acer SB220Q as it offers the best value for the money. 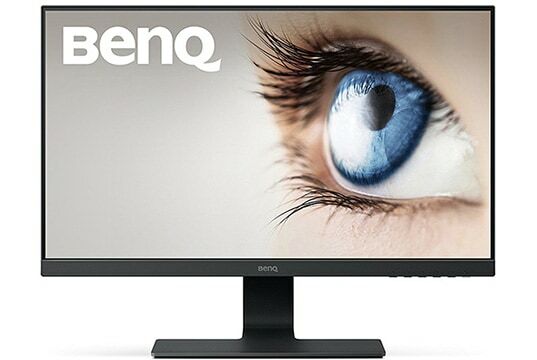 The BenQ GL2580H is a humble and reliable budget monitor, however, nowadays you can find better monitors for the money.